1. Begin by preheating oven to 180°C. 2. Place 50g of softened salted butter in a bowl. Make sure the butter is not cold from the fridge. Keep it in a warm place for an hour and it will be nicely soft. 3. Add 1/2 cup of brown sugar. 4. Mix the sugar and butter well. Until they look like breadcrumbs. 5. Drain the pineapple rings from the juice. 6. Grease a jumbo cupcake pan. 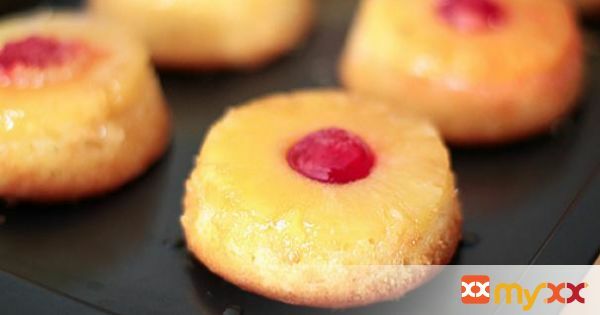 Each cupcake dish should hold 1 pineapple ring comfortably. 7. Place about a teaspoon of the butter-brown sugar mixture in each cupcake dish and press the mixture down. 8. Place a pineapple ring on top of every layer of butter-brown sugar mixture. 9. Add a glaced cherry to each cupcake dish. 10. Set the cupcake pan aside. 11. In a large mixing bowl, add 125g of softened salted butter. 12. Cream it until it’s a mushy pile. 13. Add 2/3 cup caster sugar. 14. Cream the sugar and butter well. Make sure they are well combined. 15. Add 2 large eggs. Mix well. 16. Add 1 teaspoon of vanilla extract. 17. Add 2 teaspoons of baking powder. 18. Add 1/2 cup of whole milk. Mix well. 19. Add 1.5 cups of plain flour. 20. Mix well to combine. 21. When the ingredients are well combined and the batter is ready, measure an equal portion of batter for each cupcake. I usually use a small ice cream scoop for this. 22. Add the batter to the cupcake pans. The batter should reach about 3 to 4mm short of the top in the cupcake pan. DO NOT OVERFILL. 23. Ensure all the cupcake dishes are filled. 24. Place in the oven and bake at 180°C for 20-25mins. Watch the cupcakes. They are done when the tops are golden brown. 25. You can check if the cupcakes are done by inserting a skewer stick or knife in the centre of a cupcake. If it comes out clean, then it’s done. 26. Cover with a clean kitchen cloth and let the cupcakes cool for 10 minutes. 27. While they are still warm, use a very sharp knife or bread knife and slice the tops of the cupcakes off. You can eat the tops and do a taste test here or discard them. 28. Run a thin knife around each cupcake in the pan if you think they are stuck to the pan. 29. Plan a large baking tray over the cupcake pan. And quickly invert over. 32. Immediately transfer these cakes to a large dish. Cover the dish with very tight cling wrap and keep the cupcakes in a warm place (i.e. 50°C) for a couple of hours or until you are ready to serve. 33. This extra steaming process makes the cake super soft and moist.